Ernest Gambaro (BSAE '60, MSAE '61) and wife Monica were honored Feb. 16 in Naples, Fla., for their deep commitment and strong support of AAE. The Gambaro Graduate Program of Aeronautics and Astronautics was approved by Purdue's Board of Trustees on Dec. 7, 2018. Ernest Gambaro was honored at the President's Council event in February in Naples, Fla.
A transformational gift to Purdue University’s School of Aeronautics and Astronautics (AAE) was made by alumnus Ernest Gambaro and his wife Monica to endow and name the school’s graduate program. 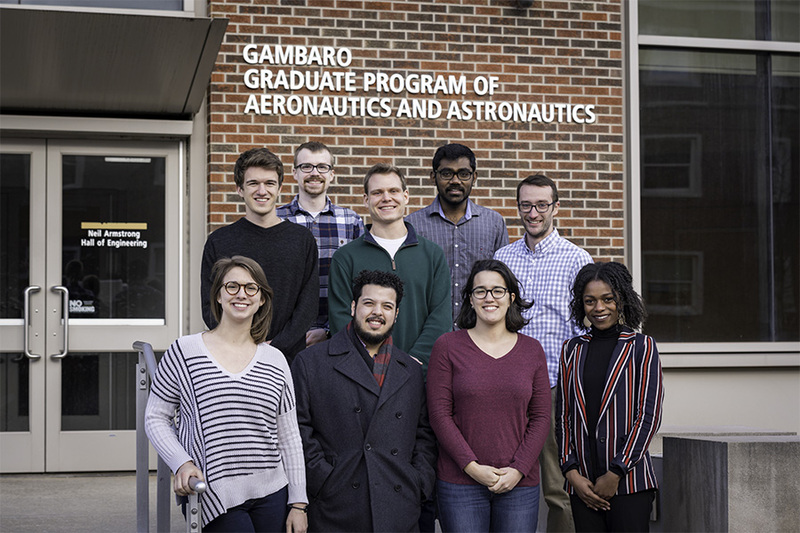 The name — Gambaro Graduate Program of Aeronautics and Astronautics — was approved by Purdue’s Board of Trustees on Dec. 7, 2018. Gambaro (BSAE ’60, MSAE ’61) and his wife were honored on Feb. 16, 2019, in Naples, Fla., for their deep commitment and strong support of AAE and for the huge impact their gift will enable. Purdue has the only named aero graduate program among the top-10 ranked schools by U.S. News and World Report and has the only named aero graduate program among Big Ten institutions. 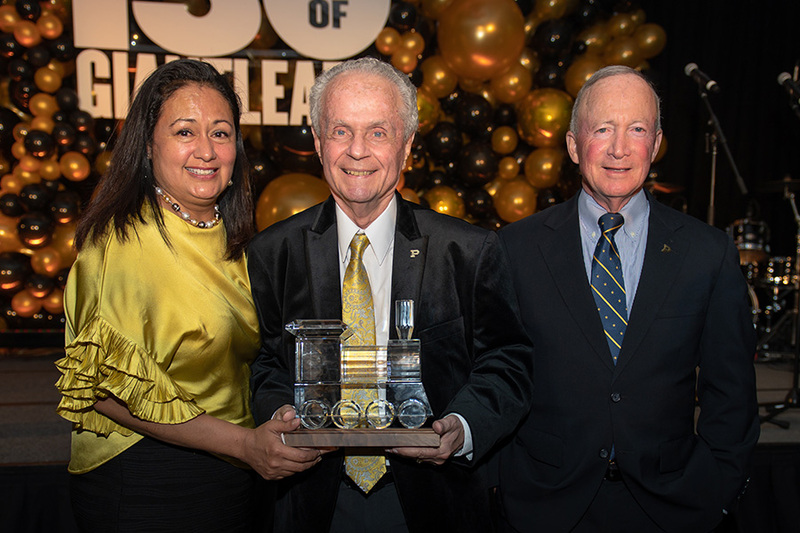 Ernest Gambaro (BSAE ’60, MSAE ’61) and wife Monica were presented with the Crystal Train Award by Purdue President Mitch Daniels (right). The endowment will allow the graduate program to improve the capability to attract top students by enhancing national visibility and providing financial resources, says Weinong Chen, AAE’s Associate Head for Graduate Education and the Reilly Professor of Aeronautics and Astronautics & Materials Engineering. “Both are critical to the continuing success of a top aerospace graduate program in the nation,” Chen says. During the past decade, enrollment in AAE’s graduate program markedly increased, and the number of Ph.D. students doubled. In 2009-10, AAE had 341 students of which 105 were Ph.D. During Fall 2018, AAE had a total of 522 graduate students of which 210 were in the Ph.D. program. The number of master’s and doctorate degrees also greatly increased. In 09-10, AAE awarded 73 master’s and 18 doctorate degrees compared to 130 master’s and 27 doctorates in the 2017-2018 academic year. That’s the approach he brought to Purdue in 1956, and it spurred him to many achievements during his time on campus. He was a member of Tau Beta Pi, for excellence in engineering, and Sigma Gamma Tau, for excellence in aeronautical and astronautical engineering. He was founder and first president of the Purdue chapter of Omicron Delta Kappa, the national society that recognizes student leadership. When he graduated with a bachelor’s degree in 1960 and a master’s in 1961, he did so with honors. In 1961, he was named a Fulbright Scholar by the Institute for International Education and the United States Government. In 1962, Gambaro joined The Aerospace Corporation conceptual design group and oversaw creation and implementation of most Air Force experiments aboard the Gemini spacecraft, and he also was part of the payload and mission design for the Manned Orbital Laboratory program for the Air Force. Later, he was assigned to the special projects group where he and a team crafted initial designs for the country’s premier orbital reconnaissance system. While at The Aerospace Corporation, Gambaro enrolled at Loyola University in Los Angeles to become a lawyer and, ultimately, transferred to the company’s corporate law department. In 1980, he became the Assistant General Counsel of Computer Sciences Corporation (CSC), one of the nation’s leading telecommunications companies. In 1988, he and a partner formed Infonet Services Corporation, which became the largest provider of secure data network services to large and mid-size multinationals. Gambaro retired in 2000. In 2016, he was honored by AAE as an Outstanding Aerospace Engineer, an award given to alumni who have distinguished themselves by demonstrating excellence in industry, academia, government service or other endeavors that reflect the value of a Purdue aerospace engineering degree. That banquet was a special one for Gambaro, not necessarily because he was honored but because he made a special connection with AAE student Robert “Bo” Ilgenfritz. Gambaro’s encouragement and inspirational story so moved Ilgenfritz, Ilgenfritz drew on comments from Gambaro and incorporated them in his senior speech to fellow members of Purdue’s swimming and diving team at the banquet the next night. Gambaro says the moment was very touching, and, in a sense, it kindled in him the idea for the transformational gift years later. Gambaro calls Purdue a great institution and credits the aero school for helping him build a foundation for what he’s achieved in life. And he expects the university and the school to continue to offer that transformational opportunity to more students.